Is “Toki Pona” Suitable for Narrative Scripting? In the previous article, I explored the necessary elements of a “Minecraftian” game mechanic: one tailored for accessible and steady skill development, one that is equal parts editable and adaptable, visual and simple, granular and tabular. I then addressed many issues with leveraging common languages to describe abstract concepts in this kind of mechanic. They are frequently hard to master. The Latin-based ones focus more on sounds than they do meanings. Their complexity warrants excessive processing for computer algorithms that are impractical for any imminent use on the scale with which we intend to use them. Relying on existing language saves learning time, but only for a subset of the intended audience; for others, it is an ostracizing element that comes with the expectation of translating into other existing languages to provide the same privileges to alternative audiences. It would also bias any software made against younger players with underdeveloped language skills. Because of these considerations, we began to consider the language Toki Pona as a possible tool to adapt for narrative scripting. What are the advantages of this Simple Language? Are there any problems with it? Let’s dive in and find out. Let’s first review what exactly we mean by “narrative scripting”. What sorts of tasks are we actually wanting to perform with this language? We’ve already established many of the characteristics we are looking for from our Minecraft analysis, and while Toki Pona meets many of these criteria, we must also consider the actual usage environment of our target language before we can significantly evaluate the utility of Toki Pona. Before continuing, I would also like to point out that this sort of narrative scripting is entirely distinct from the “narrative scripting” language known as Ink. Scripting languages in general are just languages that are more user-friendly and provide a more intuitive, simple interface for computer-tasks that would otherwise be fairly complex. With Ink, the goal is to inform the computer of the relationships between lines of dialogue in branching story lines. In our case, the goal is to inform the computer of the narrative concepts associated with game world objects, actions, and places so that it can 1) interpret meaning based on those associations and 2) trigger events that can be leveraged by AI characters, world controls, and human players/modders to create behavior and change the game world. We want to put this kind of control in the hands of players. Skyrim-creator Bethesda’s “creation kit” modding tool has its own scripting language as well, to edit objects/events in the game world. It is a bit technical though. places’ geography, geometry (both its form and absolute and relative locations), and thematic atmosphere. objects’ nomenclature, physical and functional characteristics, relative purpose, effects, history, ownership, and value. human’s (and, as a categorical subset, animals’ and human-like creatures’) nomenclature, physical and emotional characteristics, relationships, state of mind, responsibilities, history and scars, beliefs, tastes, hopes and dreams, fears, biases, allegiances, knowledge, awareness, senses and observations, skills and powers. concepts’ and ideologies’ subject domain, relationships, and significant details. These qualities will allow the user to competently describe an environment and the items, creatures, and people in it. In addition, for accessibility and then functional purposes, we need the language to be useful for the following tasks: 1) scenario descriptions, 2) dialogue, and 3) computer processing. The attributes above cover the first case. Ideally, dialogue “options” wouldn’t exist, and we would be able to directly input a writing system that the non-player characters would be able to understand without some preset arrangement of scripted responses. As for dialogue, that means it must also be able to model questions, interjections, quotations, prepositions, nouns, adjectives, and adverbs (common syntactic structures). It must accommodate the linguistic relationships between terms and their relative priority, e.g. is X AND/OR’d with Y, are these words a noun/adjective/adverb, are they subject/object, which adjectives describe the noun more clearly, etc. We must also have some means of singling out identifiers, i.e. terms that refer to things that are not themselves a part of the language (a player’s name, for example). Finally, we must also ensure that the language’s structural simplicity is reinforced so that its consequent processing is more easily conducted by computer algorithms. This primarily involves restricting the number of syntactic rules, lexicon size, but also includes more subtle nuances like the number of interpreted meanings for a given set of words and the number of compound words. The words must be, as much as possible, “perpenyms” of one another; that is, they must be perpendicular in meaning to their counterparts, neither synonyms – for obvious reasons – nor antonyms, to prevent you from simply saying, “not [the word]” to get another word in the language. The words must have a high number of literal or metaphorical interpretive meanings laced within them to ensure a maximum number of functionally usable words per each learned word. Keep in mind, these interpretations must also be strongly linked by theme so that the words’ definitions will be easy to remember. If possible however, these multiple meanings should be individually interpretive based on context, so that one can assume in any given context one interpreted meaning vs. another somewhat clearly. The more this is supported, the less work the computer will be doing. For example, in Toki Pona, the word “tawa” can mean “to go” as a verb, “mobile/moving/traveling” as an adjective, “to, until, towards, in order to” as a preposition (notice how each of those are generally applied to different preposition objects, to help pick out which one is being used), or even, “journey/transportation/experience”, literally “the going” as a noun. Each context can be easily identified based on the positioning of the word in a sentence, each run along a common theme, but each also have a unique connotation that can be interpreted rather well in context. The words must be highly reactive with their fellow terms so that a high number of reasonable compound words can be made. Again, the goal is to maximize the number of unique meanings we can derive from the minimum set of words to learn. This will increase the number of vocabulary terms, but in a less defined way as the minimalist nature of the language will make it favor interpretation of clear-cut meanings anyway. Therefore, alternative constructions for the same compound word concept won’t be too big of a deal. As previously mentioned, Toki Pona has many desirable characteristics that we seek in developing a narrative scripting language. Limited syntax and vocabulary clears the user-accessible and computationally efficient requirements (3). Toki Pona also does an excellent job of functioning as dialogue since it was designed from the ground up to be used conversationally (2). The language has an exceptional potential to detail a wide variety of topics, and although it tends to be extremely vague, enough detail can be made to elucidate the general meaning of an idea. However, there are some details about the language that have the effect of restricting its potential, namely the fact that the languages’ creator, Sonja Lang, designed it based on addressing the linguistic needs of a hypothetical, simplistic, aboriginal people on an island. As such, the language is not completely designed from the ground up to account for a maximization of functional vocabulary and in fact caters to the range of topics and activities that such a people would participate in. 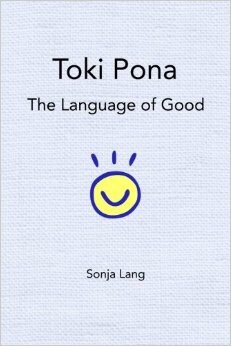 The 2014 guide to Toki Pona, occupying an entire word in the language. For example, the language includes words like “pu” (meaning “the book of Toki Pona”), which is utterly meaningless for our purposes, and “alasa” (meaning “to hunt, to forage”), which fails on perpendicularity since you can easily create the same meaning with phrases like “tawa oko tan moku” (meaning “to go eyeing/looking for food”). Also, despite how much the language does to accommodate different modes of verbiage, (including past, present, future, progressive variations of each, etc. ), it can be troublesome to express some necessary concepts since “wile” (the word for “want to”) itself encompasses want to, must or have/need/required to, and should/ought to, each of which are highly distinct and significant nuances. Although, some inventive uses for verbiage have been adapted for a lacking vocabulary. For example, a person can convey that he or she should do something by using the command imperative on themselves as a statement, e.g. “mi o moku” => “Me, eat” => “I should eat”, distinct from “mi moku” => “I eat.” These intricacies must be learned on top of any such vocabulary or syntax rules though as they are built upon usage conventions and through their obscurity inevitably hinder the accessibility of the language. As such, it would appear that the most effective strategy would be to develop a derivation of Toki Pona, built on the same principles and leveraging much of the same language, but stripping it down to only the elements that are most critical for communication and plugging up gaps in linguistic coverage as much as possible. While we won’t iron out the entirety of a language in one sitting, we can likely get a sense for what sorts of concepts must be included as core elements. If we limit ourselves to include 150 words (and even that is really stretching it, if we want to keep the language as effective as possible), then let’s see what ideas are really needed. We must also then include elements that are uniquely necessary to fulfill our needs of describing the nature of people and relationships. Ideally, we would be able to get many of these meanings using the same words, but just applying them to a different object. For example, if we had the word “bitter”, we could use it to describe a perception, the overall nature of a relationship (or perhaps even the feelings experienced by one party in the relationship), or someone’s personality, e.g. they are a bitter and resentful person, etc. In our analysis of Toki Pona, we covered the fact that it has many advantages in regards to fulfilling our requirements as a narrative scripting language; namely that it can be used as dialogue and has a high number of meanings per learned vocabulary term, and therefore it is able to cover a lot of topics with little base learning time involved. However, we have also determined that the language has many flaws due to the original design purpose: meeting the linguistic needs of an isolated and tribal hunter-gatherer people. As such, there are many unnecessary terms and some concepts which simply cannot be conveyed adequately, if at all. We can therefore state that the best course of action would be to derive a new language from the structure and vocabulary of Toki Pona, shaving away “the fat” as it were, and editing the language to bolster its linguistic breadth and depth while still staying true to its minimalist nature. To that end, we outlined several topics of vocabulary that would be essential for outlining a narrative scripting language. In future articles, I’ll begin to address the interface we may see in a narrative scripting editor and identify actual gameplay mechanics we could see with narrative scripting put into practice. Please feel free to leave comments if you have any further insights or criticisms and stay tuned for more! Previous Article: What is “Minecraftian Narrative”?